Today I made Who Knows Mommy Best? 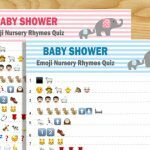 – Free Printable Baby Shower Game in four different colors. These game printables are in PNG format and you can easily print these using your home printer. The best size for these games is A4 but you can resize and scale these according to your requirements, using your printer’s settings. If you need any help or need to ask any question, you can always post a comment below. 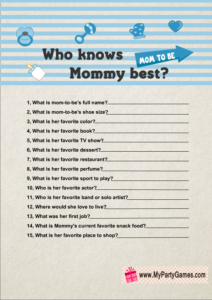 Print and distribute the who knows mommy best game worksheets among your baby shower party’s guests. Give each guest a pen or paper along with the game worksheet. 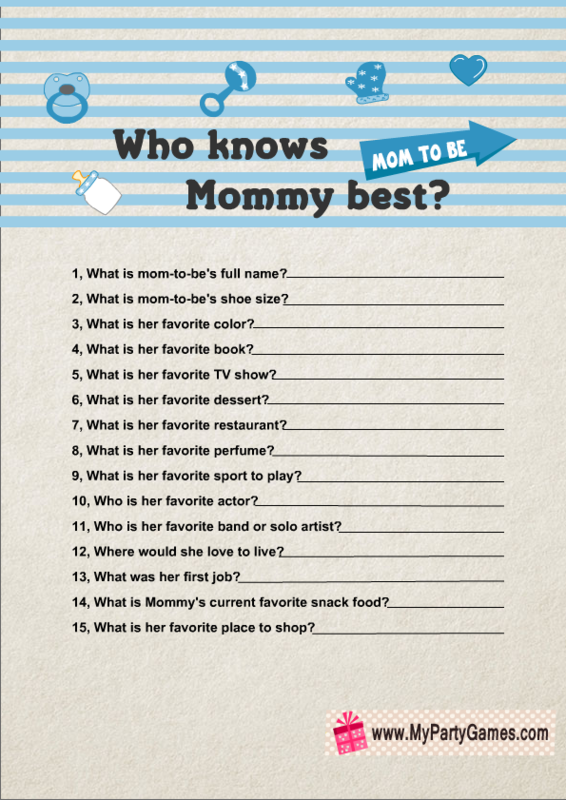 Ask them to write the answer in front of each question about mom-to-be. When all the guests have finished writing their answers, ask mom-to-be to take a worksheet and give honest replies for all the questions. The person with all correct answers will be the winner. Click on the thumbnail image of this game and a bigger image will open up. You can right click and save that image to your computer. 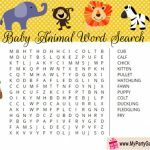 You should print the copies of this game according to the number of your baby shower party’s guests. Here is another free printable worksheet for this game, in blue color. I have decorated the game printable with cute baby related graphics such as a pacifier, a rattle, a heart and baby milk bottle etc. This is another free printable for this game in yellow color. 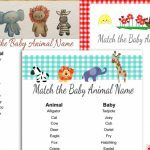 You can use this gender neutral game printable if the parents to be do not know or do not want to reveal the gender of the baby. This is another gender neutral printable for this game in green color. It has the same design as all the other printables that I have made but the objects and header are in green color. 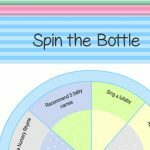 This website has this adorable game in 9 different colors and all files are high quality and non editable PDF’s. You can customise the game in your favorite color and can also change the layout. You can log in with facebook and a basic quality printable is absolutely free. This is a very basic and simple printable, with a white background but it will help you saving the ink. 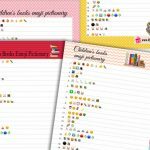 I hope that you would like the free printable games that I have offered and also the other games that I have collected. I’ll be looking forward to get your feedback.